We want to show you what the surfing lifestyle is all about! Being in contact with nature and keeping your body and mind in balance. Our mission is to provide our guests with not only high quality surf instruction, but also surf and yoga holidays full of fun and great time. 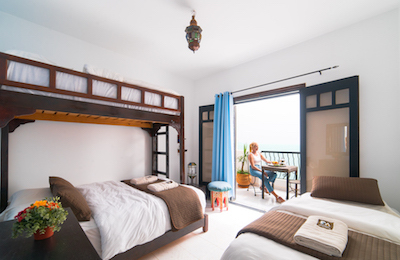 The surf house is equipped with 10 bedrooms, 2 bathrooms, 2 kitchens and a TV room upstairs where you can choose between surf movies or world channels, books and surf magazines. The rooftop terrace is ideal for barbecues at night or just to relax. Our another location Surf Riad Imourane, is located close to all Tamraght village amenities and 4 km from the village of Taghazout, The Crocro surf spots are at 600m (5 minutes walk) from the surf riad, with 18 Rooms, among which 3 suite all overlooking an interior courtyard with a small pool, heated year-round. There are two big terraces with ocean views. All rooms are equipped with toilet, shower or bath, free WIFI. The town itself is an ideal place to discover local restaurants, surf shops and traditional market, all within a few minutes walk from the house. Whether you are looking for a surf adventure, immersing yourself in Moroccan culture or just pure relaxation, you will find it all here at our surf camp. At, the surf camp, we want to show you what the surfing lifestyle is all about! Being in contact with nature and keeping your body and mind in balance. Our mission is to provide our guests with not only high quality surf instruction, but also surf and yoga holidays full of fun and great time. 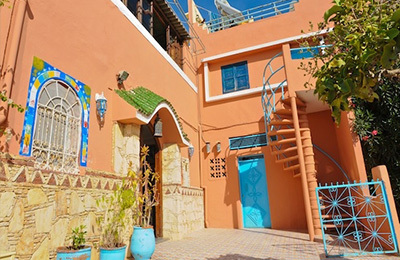 Surf riad, is located close to all Tamraght village amenities and 4 km from the village of Taghazout, The Crocro surf spots are at 600m (5 minutes walk) from the surf riad, with 18 Rooms from single to quadruple, and 3 suite all overlooking an interior courtyard with a small pool, heated year-round. SURFING AND MORE…You are in search of 100% adrenaline or you prefer rather give you a moment of relaxation? We offer you the opportunity to discover many activities. Our surf initiation package is designed for beginners and intermediate surfers wanting to take a step forward with the help of an accredited surf coach so that they’ll really notice a significant improvement at the end of their stay. Beginners focus on riding the “foam” and work on their take-off while intermediate surfers are assigned a set of “achievements” such as making the bottom turn and riding a green wave or improving their rollers and cut-backs. The surf guiding package is designed for surfers looking for total peace of mind. You will be guided every day to the best spots for your ability, from Agadir to Imsouane. Our surf guides locale have a deep knowledge of the area and will make sure you surf the right spot at the right time. Your safety will always be our highest priority, and the surf guides will surf with you and tell you everything you need to know about the specific spot configuration (rips, winds, rocks, sand banks et). Yoga has proved its efficiency on the body and soul for centuries and is a great complement to surfing. Many pro surfers practice it on a daily basis to improve their concentration, flexibility and physical abilities to paddle longer and surf better. It also helps your muscles recover faster after an intense day of surfing. The aim of our yoga classes is to be very accessible to beginners, and for people already practicing it to focus on the most useful asanas (exercises) for surfers. Yoga & surf helps you to balance and control your body and mind, and renew your energies. These exercises help you stay in great physical condition and make you strong and flexible, and protect your body from diseases. Yoga reduces fatigue and calms the nerves and the mind. In addition to the asanas we control and tranquilize our breathing to be more focused and relaxed. The breathing technique specific to yoga cleans your body and mind. Discover our yoga sessions without further delay this discipline, it is a philosophy of life, which is good for the body and spirit. We offer rental for walks and dromedary has chevale, 1, 2, 3, or a day introduce the range starting from Aourir and management Taghazout, an unforgettable experience! Our spa offers a wide range of berber care, such as massage has the argans oil. hammam an important social phenomenon, scrub soap. Discover the charming city of Essaouira on foot, visit the bustling harbor and watch the fishermen and their fish enjoy specialized fish restaurant. Agadir morocco, Tamraght beach area is known for its great waves and beautiful natural sandy beaches of Agadir with more than 300 days of sun a year. With so many beautiful Morocco surf spots to choose from, we will take you at the best location to learn surfing on the day. Agadir is served by direct flights (2-3 hours) from key major European airports. 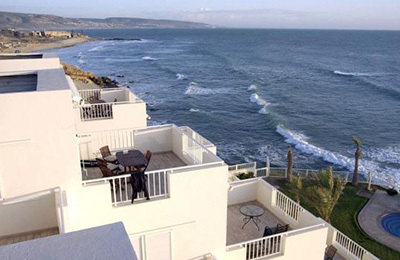 Upon arrival , we will transport you from the airport of Agadir is a 45 -minute drive southeast along the coastal road. You also have the option of taking a taxi to the airport for 200-300 dirhams to surf camp or take a bus from Agadir to come to aghroud (paradis beach), we will pick you if necessary. From Marrakech, you can take a bus, we recommend CTM or Supratours. 1 week: 359 € per personne. 14 days: 690 € per personne. 1 day sup: 50 € per personne. 1 week: 400 € per personne. 14 days: 780 € per personne. 1 day sup: 55 € per personne. 1 week: 399 € per personne. ✔ 5 Days x 2,5h yoga class with our yoga teacher. 1 week: 460 € per personne. 14 days: 880 € per personne. 1 day sup: 65 € per personne. 1 week: 309 € per personne. 14 days: 600 € per personne. 1 day sup: 43 € per personne. 1 week: 380 € per personne. 14 days: 740 € per personne. 14 days: 900 € per personne. 1 day sup: 60 € per personne. "This was such a fun week of surf! Amine is a great and attentive instructor, super friendly and fun to be with. Surf conditions were great and I actually improved! The riad was beautiful with good food and really friendly staff by the end of the week it felt like a little family. I would totally go back!" 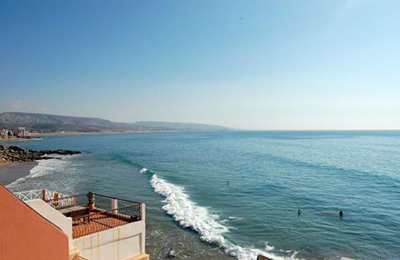 "This was our third time to agadir, first time surfing and were both beginners at yoga. It absolutely blew me away. The villa was beautiful and comfy, food was delicious and plentiful. Waking up to the sunrise yoga is the way forward. Learning to surf was most enjoyable and the instructors were rad! What really made this holiday special were the staff and other guest we met. The staff were friendly, helpful and you could have a right giggle with them." Sea, surf, friends and fun in the sun! "This camp is located just North of Agadir in a small village just above the sea. I stayed there two consecutive years. Each time, nice weather, nice food, and perfect waves whatever your level. On top of that, Amine is probably the kindest guy I ever met. If you are looking for a surf trip and much more, then it's definitively the place to be. I'll be back soon for sure !!"